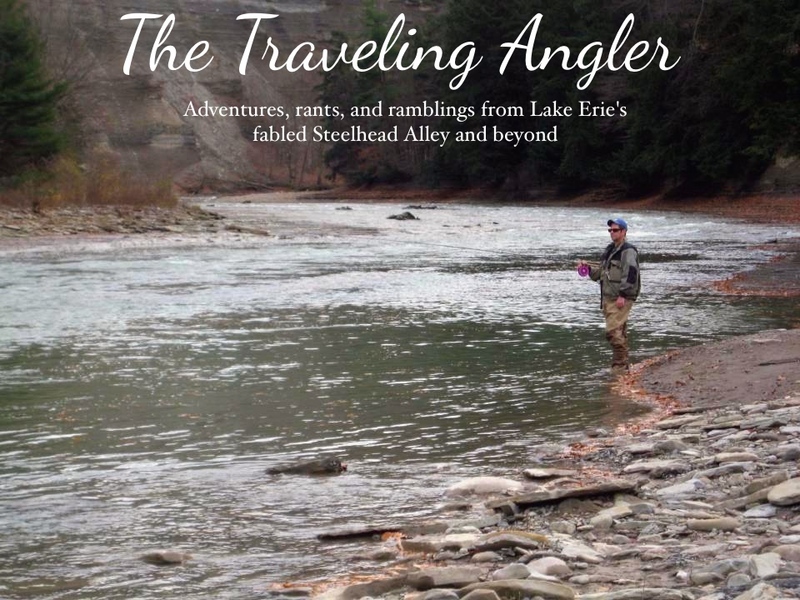 Traveling Angler: Where O Where Are The Fish? That's the question many are asking on the Alley - where the hell are the fish? In the 14 years I've been here, I've never seen numbers this low. I mean ridiculously low. It's almost like the steelhead have vanished or the population has crashed. Now I know what a steelheader in B.C feels like. With the exception of Pennsylvania, it been a struggle to find consistent number of fish here in Ohio. We've been spoiled like a group of rich kids. A skunk was so infrequent that it never crossed our mind. Double digit days were the norm. So far this year, it's been a case of practically kicking over every rock and log to find fish. Some anglers are probably seeking professional help on how to get their game back. We're thrilled to land two fish. Reality has sunk in for me as I know it will be one or two here and there. Like most, we're patiently waiting because we know the fish will eventually show up. I believe that Hurricane Sandy is the major culprit for this woeful fall. The hurricane produced 15 to 20 foot waves, major lake surges and massive flooding. Any staging fish would of been battered and the end result is all of them seek refuge miles out in the lake. 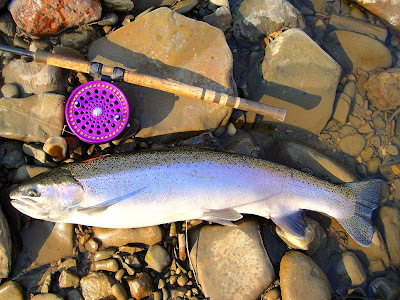 Fish have returned to staging but now the rivers are so low that very few are trickling in. Instead of fishing low, I've been fishing far up river in some cases nearly 20 miles from the lake. What was the results of Turkey Day and the day after Ohio State went undefeated? A lot better than others. Both days I ventured out at an unheard of nine in the morning. Didn't have race to any holes or pools as a matter of fact I ran into three people - a guide and two clients. As for the guide, talk about pressure. I'm sure guides on the Alley were feeling the 800 pound skunk on their shoulders. People living outside the Alley are reluctant to fork over $3.40 for gas and drive a 100 mile to get skunked. Not many happy faces on the river but what can you do? Deal with it. I used the opportunity to scout some new water on the Chagrin. Ever since the dam in Gates Mills collapsed a couple years ago, the fish have about 8 miles of new water to run up. 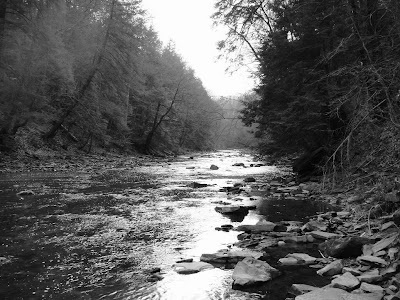 I fished the South Chagrin reservation several times last season and caught a few fish, but it was nothing to write home about. 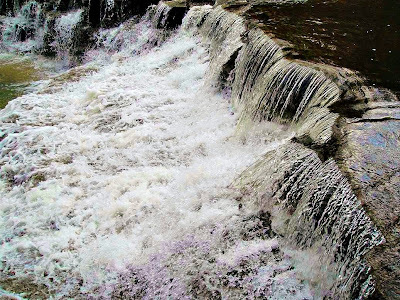 This section of the Chagrin runs through a gorge with steep shale cliffs and a series of waterfalls before the river itself splits into the East branch and the Aurora branch. The scenery here is beautiful as there are stands of old growth stands of hemlock and high cliffs. The center piece of the reservation is a rock sculpture called "Squaw Rock" that was created by artist and blacksmith Henry Church in 1885. Unfortunately this section is not the best holding water as it shallow and shale bottom. Fish will more than likely blow through it on their way up past the metro park into private waters - bummer.